Testing procedures to follow to ensure that your Universal Windows Platform (UWP) app is accessible. The Windows Software Development Kit (SDK) includes several accessibility testing tools such as AccScope, Inspect and UI Accessibility Checker. These tools can help you verify the accessibility of your app. Be sure to verify all app scenarios and UI elements. You can launch the accessibility testing tools either from a Microsoft Visual Studio command prompt or from the Windows SDK tools folder (the bin subdirectory of where the Windows SDK is installed on your development machine). The AccScope tool enables developers and testers to evaluate the accessibility of their app during the app's development and design, potentially in earlier prototype phases, rather than in the late testing phases of an app's development cycle. It's particularly intended for testing Narrator accessibility scenarios with your app. Inspect enables you to select any UI element and view its accessibility data. You can view Microsoft UI Automation properties and control patterns and test the navigational structure of the automation elements in the UI Automation tree. Use Inspect as you develop the UI to verify how accessibility attributes are exposed in UI Automation. In some cases the attributes come from the UI Automation support that is already implemented for default XAML controls. In other cases the attributes come from specific values that you have set in your XAML markup, as AutomationProperties attached properties. 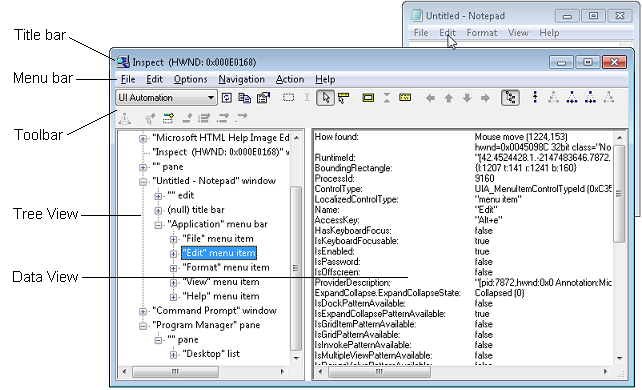 The following image shows the Inspect tool querying the UI Automation properties of the Edit menu element in Notepad. UI Accessibility Checker (AccChecker) helps you discover accessibility problems at run time. When your UI is complete and functional, use AccChecker to test different scenarios, verify the correctness of runtime accessibility information, and discover runtime issues. You can run AccChecker in UI or command line mode. To run the UI mode tool, open the AccChecker directory in the Windows SDK bin directory, run acccheckui.exe, and click the Help menu. UI Automation Verify (UIA Verify) is an automated testing and verification framework for UI Automation implementations. UIA Verify can integrate into the test code and conduct regular, automated testing or spot checks of UI Automation scenarios. To run UIA Verify, run VisualUIAVerifyNative.exe from the UIAVerify subdirectory. Accessible Event Watcher (AccEvent) tests whether an app's UI elements fire proper UI Automation and Microsoft Active Accessibility events when UI changes occur. Changes in the UI can occur when the focus changes, or when a UI element is invoked, selected, or has a state or property change. Most accessibility testing tools mentioned in the documentation run on a PC, not on a phone. You can run some of the tools while developing and using an emulator, but most of these tools can't expose the UI Automation tree within the emulator. The best way to test your keyboard accessibility is to unplug your mouse or use the On-Screen Keyboard if you are using a tablet device. Test keyboard accessibility navigation by using the Tab key. You should be able to cycle through all interactive UI elements by using Tab key. For composite UI elements, verify that you can navigate among the parts of elements by using the arrow keys. For example, you should be able to navigate lists of items using keyboard keys. Finally, make sure that you can invoke all interactive UI elements with the keyboard once those elements have focus, typically by using the Enter or Spacebar key. Use color contrast tools to verify that the visible text contrast ratio is acceptable. The exceptions include inactive UI elements, and logos or decorative text that doesn’t convey any information and can be rearranged without changing the meaning. See Accessible text requirements for more information on contrast ratio and exceptions. See Techniques for WCAG 2.0 G18 (Resources section) for tools that can test contrast ratios. Some of the tools listed by Techniques for WCAG 2.0 G18 can't be used interactively with a UWP app. You may need to enter foreground and background color values manually in the tool, make screen captures of app UI and then run the contrast ratio tool over the screen capture image, or run the tool while opening source bitmap files in an image editing program rather than while that image is loaded by the app. Use your app while a high-contrast theme is active to verify that all the UI elements display correctly. All text should be readable, and all images should be clear. Adjust the XAML theme-dictionary resources or control templates to correct any theme issues that come from controls. In cases where prominent high-contrast issues are not coming from themes or controls (such as from image files), provide separate versions to use when a high-contrast theme is active. Use the system display options that adjust the display's dots per inch (dpi) value, and ensure that your app UI scales correctly when the dpi value changes. (Some users change dpi values as an accessibility option, it's available from Ease of Access as well as display properties.) If you find any issues, follow the Guidelines for layout scaling and provide additional resources for different scaling factors. Use Narrator to test the screen reading experience for your app. Start Narrator by pressing Windows logo key + Ctrl + Enter. In versions prior to Windows 10 version 1607, use Windows logo key + Enter to start Narrator. Navigate your app with the keyboard by using the Tab key, the arrow keys, and the Caps Lock + arrow keys. For each control, ensure that Narrator reads all visible content. Also ensure that Narrator reads each control's name, any applicable state (checked, selected, and so on), and the control type (button, check box, list item, and so on). If the element is interactive, verify that you can use Narrator to invoke its action by pressing Caps Lock + Enter. For each table, ensure that Narrator correctly reads the table name, the table description (if available), and the row and column headings. Press Caps Lock + Shift + Enter to search your app and verify that all of your controls appear in the search list, and that the control names are localized and readable. Turn off your monitor and try to accomplish main app scenarios by using only the keyboard and Narrator. To get the full list of Narrator commands and shortcuts, press Caps Lock + F1. Starting with Windows 10 version 1607, we introduced a new developer mode in Narrator. Turn on developer mode when Narrator is already running by pressing Caps Lock + Shift + F12. When developer mode is enabled, the screen will be masked and will highlight only the accessible objects and the associated text that is exposed programmatically to Narrator. This gives a you a good visual representation of the information that is exposed to Narrator. Narrator automatically enters touch mode on devices that support 4+ contacts. Narrator doesn't support multi-monitor scenarios or multi-touch digitizers on the primary screen. Get familiar with the UI and explore the layout. Navigate through the UI by using single-finger swipe gestures. Use left or right swipes to move between items, and up or down swipes to change the category of items being navigated. Categories include all items, links, tables, headers, and so on. Navigating with single-finger swipe gestures is similar to navigating with Caps Lock + Arrow. Use tab gestures to navigate through focusable elements. A three-finger swipe to the right or left is the same as navigating with Tab and Shift + Tab on a keyboard. Spatially investigate the UI with a single finger. Drag a single finger up and down, or left and right, to have Narrator read the items under your finger. You can use the mouse as an alternative because it uses the same hit-testing logic as dragging a single finger. Read the entire window and all its contents with a three finger swipe up. This is equivalent to using Caps Lock + W.
If there is important UI that you cannot reach, you may have an accessibility issue. Interact with a control to test its primary and secondary actions, and its scrolling behavior. Primary actions include things like activating a button, placing a text caret, and setting focus to the control. Secondary actions include actions such as selecting a list item or expanding a button that offers multiple options. To test a primary action: Double tap, or press with one finger and tap with another. To test a secondary action: Triple tap, or press with one finger and double tap with another. To test scrolling behavior: Use two-finger swipes to scroll in the desired direction. Some controls provide additional actions. To display the full list, enter a single four-finger tap. If a control responds to the mouse or keyboard but does not respond to a primary or secondary touch interaction, the control might need to implement additional UI Automation control patterns. You should also consider using the AccScope tool to test Narrator accessibility scenarios with your app. The AccScope tool topic describes how to configure AccScope to test Narrator scenarios. Several of the UI Automation testing tools mentioned previously provide a way to view your app in a way that deliberately does not consider what the app looks like, and instead represents the app as a structure of UI Automation elements. This is how UI Automation clients, mainly assistive technologies, will be interacting with your app in accessibility scenarios. The AccScope tool provides a particularly interesting view of your app because you can see the UI Automation elements either as a visual representation or as a list. If you use the visualization, you can drill down into the parts in a way that you'll be able to correlate with the visual appearance of your app's UI. You can even test the accessibility of your earliest UI prototypes before you've assigned all the logic to the UI, making sure that both the visual interaction and accessibility-scenario navigation for your app is in balance. One aspect that you can test is whether there are elements appearing in the UI Automation element view that you don't want to appear there. If you find elements you want to omit from the view, or conversely if there are elements missing, you can use the AutomationProperties.AccessibilityView XAML attached property to adjust how XAML controls appear in accessibility views. After you've looked at the basic accessibility views, this is also a good opportunity to recheck your tab sequences or spatial navigation as enabled by arrow keys to make sure users can reach each of the parts that are interactive and exposed in the control view.